US, 1999, 149 minutes, Colour. Jodie Foster, Chow Yun Fat, Tom Shelton. Bai Lim. The story of an Anna Leonowens and the king of Siam has been very popular. It was told in the 1946 film, Anna and the King of Siam, with Irene Dunne and Rex Harrison. Then it was made more famous by the Rodgers and Hammerstein musical, the King and I, featuring Yul Brynner as the king and Deborah Kerr as Anna. 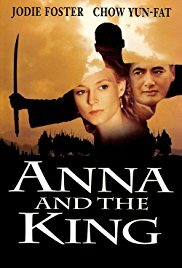 There was an animated feature in the 1990s as well as this ambitious production, Anna and the King. Jodie Foster is both prim and strong as Anna. Chow Yun-Fat? makes an interesting king. The production is quite long, almost 2 ½ hours. It is filmed in beautiful locations, mountains and valleys as well as the re--creation of Bangkok in the 19th century. This includes the poorer aspects of the city, the markets and the wharves. It also includes the affluence and beauty of the palace. The film has more political background than other versions, especially the clashes with Burma, the rebellion of the military who want no westernisation of Siam, and the difficulties of dealing with the colonial powers, especially the British and their ambitions for trade. The film has a number of local actors insignificant roles dramatising the Siamese military and politicians. There is also the story of Tuptim, relegated to the palace but in love with a young man outside, leading to their trial and execution. This is an experience of grief for Anna, and criticism of the king and his policies. Tom Felton, soon to be a villain in the Harry Potter films, portrays Louis, Anna’s son. The film was directed by Andy Tennant, a director of entertainments like Fools Rush In, Ever After, Hitch, The Bounty Hunter. 1. A lavish presentation of the well-known story? The film of the 1940s, the popularity of The King and I? 2. The big budget, the location photography, the mountains and villages? 3. The re-creation of the city of Bangkok, the 19th century, the wharves, the markets, outside the palace, inside the palace, the lavish rooms, the throne room, the Temples, the classroom? Sets, décor, costumes? The musical score? 4. The cast and the international flavour? 5. Similarities to The King and I, the theme of dancing, Tuptim’s story, the march of the children? The differences from The King and I, the King, the political implications, the clashes with Burma, the role of the British and their colonial attitudes, trade, the armies, betrayal, the need for education, the king and his ambitions for the culture of Siam? The heritage for his son? 6. The son, his voiceover, his education, the role model of his father, the beneficiary of his father’s quest for Siam? 7. Scenes on the ship, Anna and Louis, the passage from India, the past, her being widowed, British, demanding? The arrival, no one going to meet them, going to the prime minister, her being called ‘sir’, standing in the presence of authorities? Conventions and protocol? Her meeting the king, going, her plain talk? Wanting the house outside the palace? The house and the contract? The King’s attitude? not acting? 8. Meeting the children, the wives, the concubines, the first wife and her friendship? The nature of the lessons, the detail, the effect on the children? The older son, his fight, his refusing to back down, the king not taking his side? The little girl, her illness, death, the grief of the king? 9. The military background, the generals, antagonism with the Burmese, the random assassinations? The military in the field, the general? His double-dealing? Disapproval for the westernizing of Siam? His presence at the banquet, discussions with the British, his attitude towards killings and the Burmese? The threats? The attack, the death of the generals, the poisoning? His ruthlessness? Moving on Bangkok, the king and his plan, removing the children, the build-up to the confrontation, the general and his shrewdness and assessing what the King would do, the meeting at the bridge, the explosives on the bridge? Calling the bluff? The bugle playing? The explosions, deaths? The taking of the general? The confrontation by the king? 10. The British, the attitudes, trade, at the banquet, the preparation for the banquet, lavish, the dancing, Anna with the king, the chatter, the British and testing the king, yet prepared to let him go? The visitor with trade, his drinking, speaking out of place, yet warning the authorities about the plans of the general? The British pragmatic, trade? 11. The prime minister, his advice, being surprised at what was achieved? 12. Louis, his life within the palace, with the other children, very British, with his mother, the bond between them? 13. The portrait of Anna, the widow, the British woman, shielding herself from her grief, the challenge by the king, with the children, the king knowing her? 14. The portrait of the king, the traditions, yet enlightened, wanting to improve the country, his family, his children, mellowed by Anna? 15. The film based on the diaries of Anna, a romanticized version of what happened, the role of Siam in Asia, it civilization, its traditions and heritage?